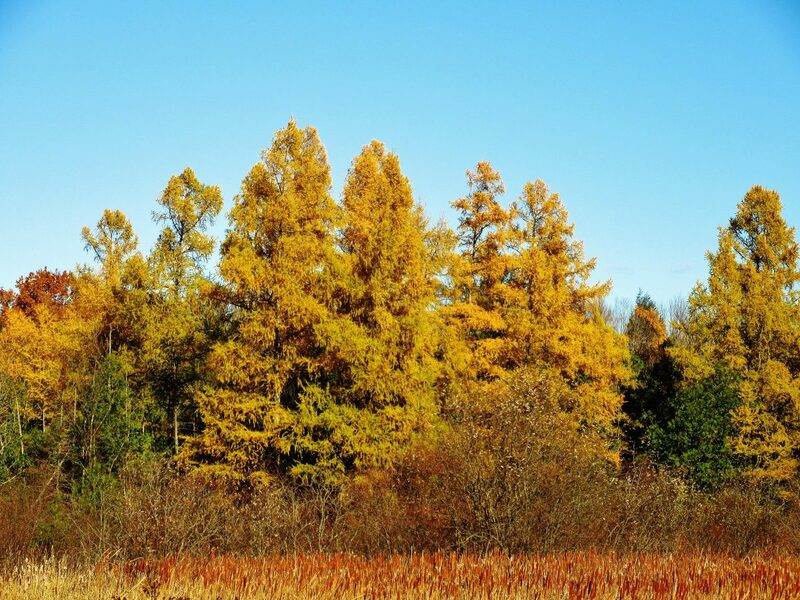 I have many favorite plants, but one of my favorite pine trees is the Tamarack, also known as the American Larch (Larix laricina). It’s such a unique tree. 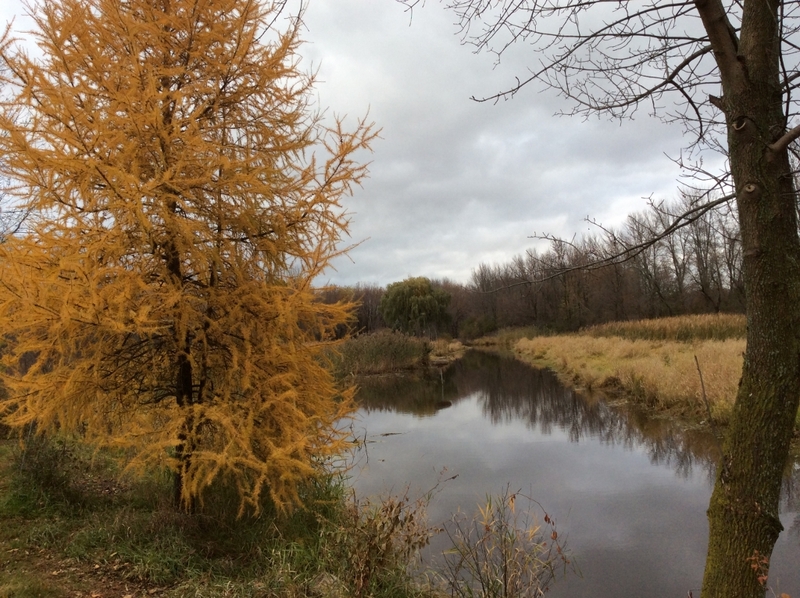 It looks like a coniferous tree, but it goes dormant every year and loses its needles — but not before turning the most beautiful shade of yellow. 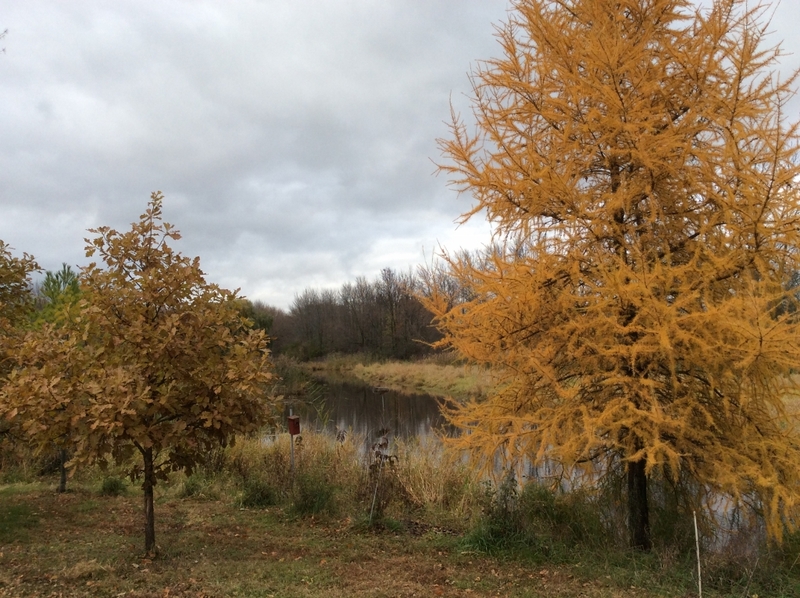 We find the Tamarack growing around our hunting property and all over in Northern Wisconsin. It likes lowlands like swamps and bogs, and grows in areas where there are sedge mats and hummocks. It also likes the cold, so as the temperature increases due to climate change, the larch will likely move further north. 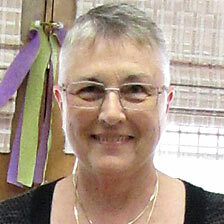 Its bark is unusual, too. The light colored bark is scaly and has a pink cast; underneath it actually looks reddish-orange. In the winter you can see lichen growing on its bare branches. Unlike most coniferous trees, it has long deep roots which help keep the larch alive for hundreds of years. Its brown pine cones are very small, typically about 3/4 inch long. All these characteristics help to make it fire resistant. 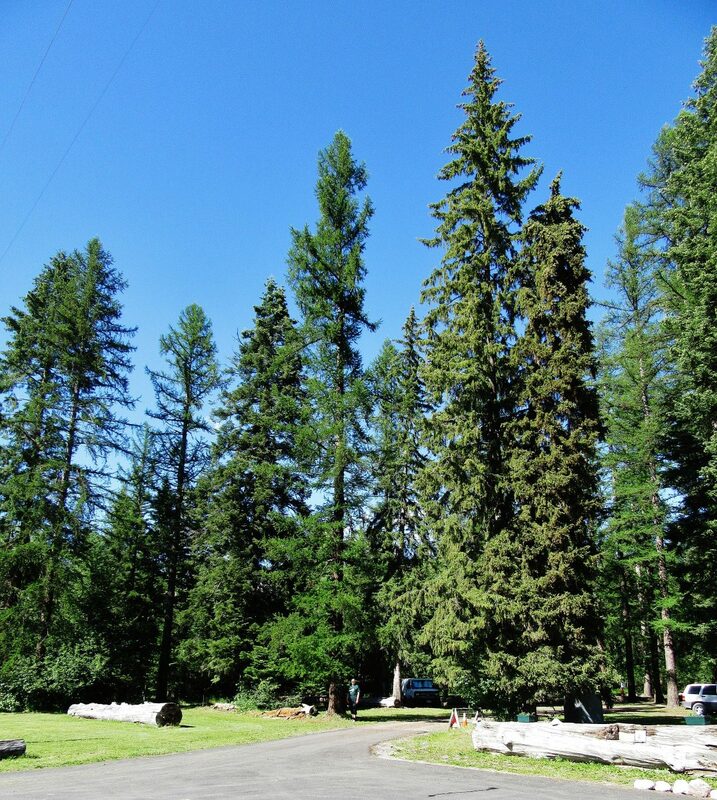 In Montana, Tamaracks can reach over 150 feet tall and over 250 inches in circumference. Here I’m standing next to a Montana Western Larch growing near a camp ground north of Seeley Lake. When I attended a wildflower conference in Montana in 2016, I talked with a fellow-attendee, who was researching the after-growth from wild fires, about my love of the larch. She told me about a small stand of the biggest larch she had ever seen at Seeley Lake in Montana. It was on the way back to the Amtrak railroad station in Glacier Park, so we made the detour. 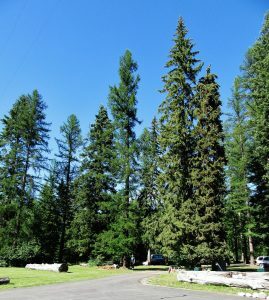 I have to say she was right — I was in such awe of the size of these trees that I forgot to take photos until we were well away from the lake. Thanks for sharing the photos, Ken, and for mentioning Janice’s book “The Inside Story.” That’s one of my favorite go-to books to find the secrets about some plants.